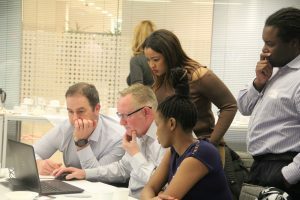 On Wednesday we were delighted to host the CIPS Central London branch event and give Market Dojo the opportunity to assess the region’s online negotiation skills! 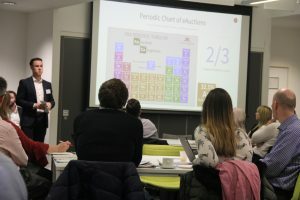 The event was a repeat of our successful CIPS South West session a few weeks prior, and so it was interesting to discover whether the nation’s capital had any contrasting ideas. 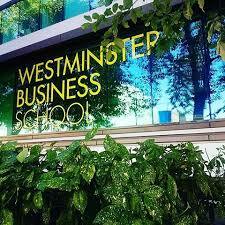 We were warmly hosted by the University of Westminster, aided by Nick Barnett, the Course Leader of the University’s MSc in Purchase and Supply Chain Management. At which point we should clarify that the University of Westminster Business School isn’t in fact in Westminster. Rather it is a 20-minute tube journey north to Baker Street, as a couple of our team members discovered! We were impressed by the quality of delegates at the event, representing a number of global firms from Diageo and Shell to KPMG and Thales. However, it still highlighted that eAuctions are not as widely acknowledged as you might expect. From our previous benchmarks, 96% of respondents had heard of eAuctions and circa 60% either had one in progress or would do so in the next 6 months. At this event, by the show of hands, nearly everyone had heard of eAuctions yet less than 5% actually had any on the horizon. What this may indicate is that either they are strongly out of favour – which contradicts what we see amongst FTSE 250 companies – or us Procurement folk have little indication of which projects could conclude with an eAuction. Now that does strongly correlate to our own research and is precisely why we set up an on-demand eAuction model. We intend to be here when you need us and will only charge for that specific need. On with the event. We initially covered some of the backgrounds of eAuctions, supported by some unique industry examples of best practice. Then we openly discussed some of the benefits, challenges and perceptions of auctions, touching upon their applicability to certain circumstances. This leads us on to some truly excellent Q & A that lasted over 20 minutes, with the questions covering a range of issues from category-specific concerns (buying proprietary software) to bidding behaviour (unsustainable bids) to integrating non-price factors into the eAuction (weighted eAuctions). We just about gave ourselves enough time to run the highlight of the evening; our eAuction Game. The rules of the game are simple: there are 4 Lots to bid on and suppliers must try and ‘win’ as many of those Lots as possible without going bust. We had 7 teams on the night with up to 9 people per team. This encouraged some excellent dialogue and competitive dynamics. As expected, there was one team who went bust and their bids were struck from the auction with immediate effect. Otherwise, our bidders performed very well, with 36 bids received over 12 minutes. 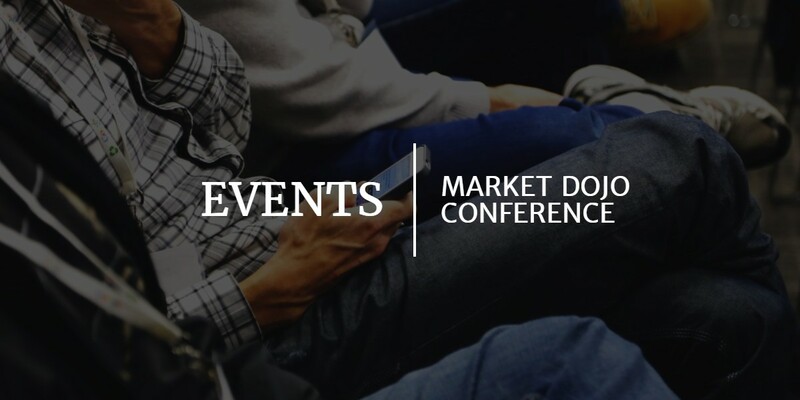 Some teams adopted the sensible strategy of gradually reducing their margins over a series of minor bid decrements, using market feedback to gauge where to bid next, whilst others felt inclined to drop their margins in one or two fell swoops! The night was concluded with a final Q & A session and debrief on how best to maximise your chances of success in future eAuctions. Even though we work in Procurement, it can be hugely worthwhile to appreciate the supplier experience in these negotiations to help you succeed with your objectives. In summary, it was a wonderful evening, so many thanks to our hosts, Westminster Business School, and our CIPS representatives, Argentina Hung, Vincent Townsend and Shatu Mbursa-Mshelbwala for welcoming us along. We hope to see you at another event soon.